Microvirga is one of the most recently discovered genera of Proteobacteria known to engage in symbiotic nitrogen fixation with legume plants, and joins a diverse set of at least twelve other lineages of Proteobacteria that share this ecological niche [1-4]. Several genera of legume root-nodule symbionts have a world-wide distribution and interact with many legume taxa. By contrast, symbiotic strains of Microvirga are currently known from two distant locations and only two legume host genera [5,6]. The limited geographic and host distribution of Microvirga symbionts, along with the fact that root-nodule symbiosis is not characteristic of the genus Microvirga as a whole , suggest a relatively recent evolutionary transition to legume symbiosis in this group. M. lupini is a specialized nodule symbiont associated with the legume Lupinus texensis, an annual plant endemic to a relatively small geographic area in central Texas and northeastern Mexico . The genus Lupinus has about 270 annual and perennial species concentrated in western North America and in Andean regions of South America, and a much smaller number of species in the Mediterranean region of Europe and northern Africa . Basal lineages of Lupinus all occur in the Mediterranean and are associated with bacterial symbionts in the genus Bradyrhizobium [9,10]. Bradyrhizobium is also the main symbiont lineage for most Lupinus species in North and South America, although a few Lupinus species utilize nodule bacteria in the genus Mesorhizobium [10-13]. 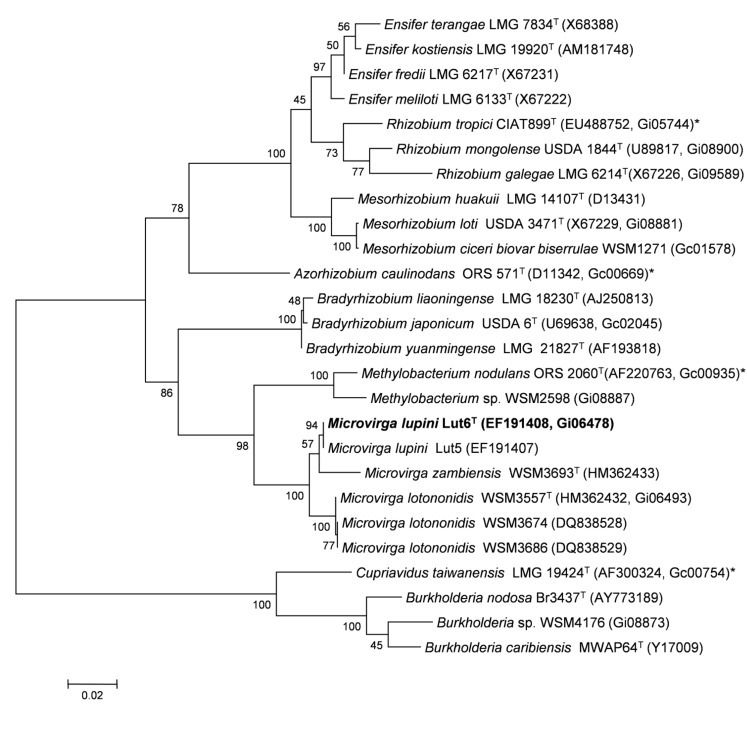 Thus, the acquisition of symbionts in the genus Microvirga by plants of L. texensis appears to be an unusual, derived condition for this legume genus. L. texensis occurs in grassland and open shrub communities with an annual precipitation of 50 - 100 cm, on diverse soil types . L. texensis appears to have a specialized symbiotic relationship with M. lupini in that existing surveys have failed to detect nodule symbionts of any other bacterial genus associated with this plant . Moreover, inoculation experiments with other North American species of Lupinus, as well as other legume genera, have so far failed to identify any plant besides L. texensis that is capable of forming an effective, nitrogen-fixing symbiosis with M. lupini . M. lupini strain Lut6T was isolated from a nodule collected from a L. texensis plant in Travis Co., Texas in 2006. Here we provide an analysis of the complete genome sequence of M. lupini strain Lut6T; one of the three described symbiotic species of Microvirga . M. lupini LUT6T is a non-motile, Gram-negative rod in the order Rhizobiales of the class Alphaproteobacteria. The rod-shaped form varies in size with dimensions of 1.0 μm for width and 1.5-2.0 μm for length (Figure 1 Left and Center). It is fast growing, forming colonies within 3-4 days when grown on half strength Lupin Agar (½LA) , tryptone-yeast extract agar (TY)  or a modified yeast-mannitol agar (YMA)  at 28°C. Colonies on ½LA are white-opaque, slightly domed and moderately mucoid with smooth margins (Figure 1 Right). M. lupini LUT6T was cultured to mid logarithmic phase in 60 ml of TY rich media  on a gyratory shaker at 28°C. DNA was isolated from the cells using a CTAB (Cetyl trimethyl ammonium bromide) bacterial genomic DNA isolation method . All general aspects of library construction and sequencing performed at the JGI can be found at . The initial draft assembly contained 1,719 contigs in 6 scaffolds. The 454 paired end data were assembled together with Newbler, version 2.3-PreRelease-6/30/2009. The Newbler consensus sequences were computationally shredded into 2 Kbp overlapping fake reads (shreds). Illumina sequencing data was assembled with VELVET, version 1.0.13 , and the consensus sequence computationally shredded into 1.5 Kbp overlapping fake reads (shreds). 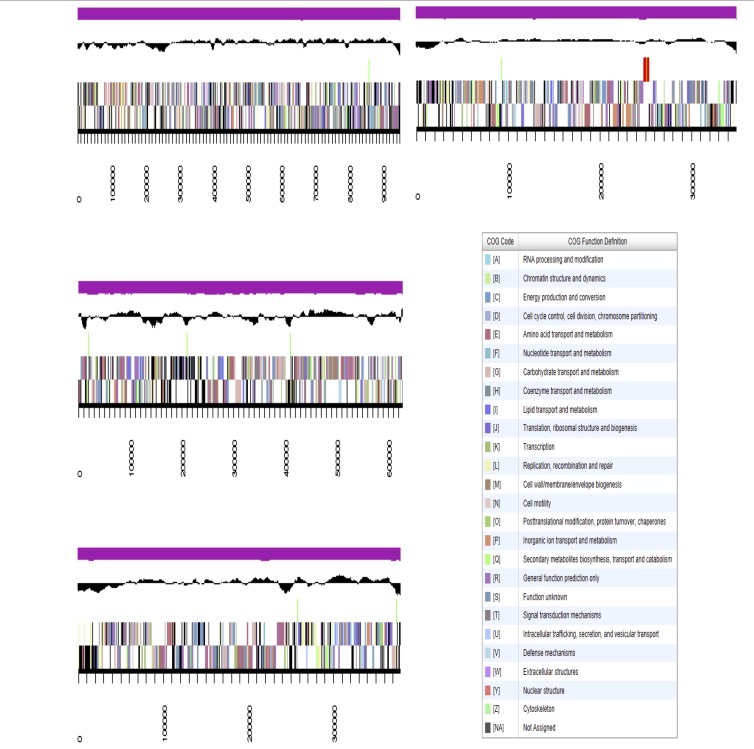 The 454 Newbler consensus shreds, the Illumina VELVET consensus shreds and the read pairs in the 454 paired end library were integrated using parallel phrap, version SPS - 4.24 (High Performance Software, LLC). The software Consed [40-42] was used in the following finishing process. Illumina data was used to correct potential base errors and increase consensus quality using the software Polisher developed at JGI . Possible mis-assemblies were corrected using gapResolution (Cliff Han, unpublished) or Dupfinisher . Some gaps between contigs were closed by editing in Consed. The estimated genome size is 10.3 Mb and the final assembly is based on 36.2 Mb of 454 draft data which provides an average 3.5x coverage of the genome and 3,090 Mbp of Illumina draft data which provides an average 300x coverage of the genome. Simms EL, Taylor DL, Povich J, Shefferson RP, Sachs JL, Urbina M, Tausczik Y. An empirical test of partner choice mechanisms in a wild legume-Rhizobium interaction. Proceedings of Biological Sciences 2006;273(1582):77-81. Garrity GM, Bell JA, Lilburn T. Family IX. Methylobacteriaceae fam. nov. In: Garrity GM, Brenner DJ, Krieg NR, Staley JT (eds), Bergey's Manual of Systematic Bacteriology, Second Edition, Volume 2, Part C, Springer, New York, 2005, p. 567.